Until the 10th of September you can enjoy the Summer of Heroes at Disney California Adventure park. We were there last week, and so I have prepared this special guide to every aspect of the Summer of Heroes for those of you visiting within the next two months. 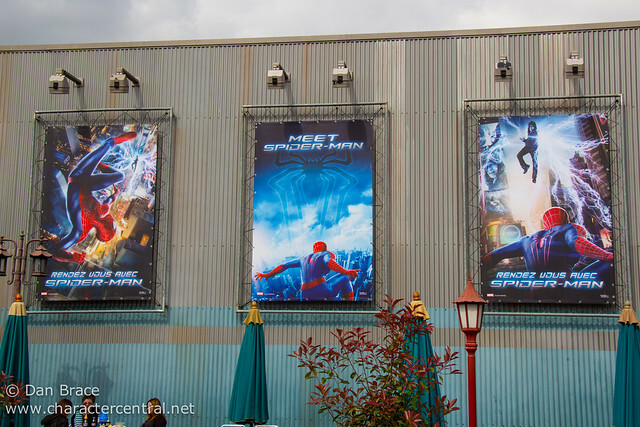 The other day the Disney Parks Blog announced that Spider-Man would be making his US Disney Parks debut on November 16th at the new Super Hero HQ, in Tomorrowland at Disneyland. In the comments section, Communications Manager, Shawn Slater, confirms that Captain America would be leaving Disneyland for the time being, but didn't rule out his return in the future. 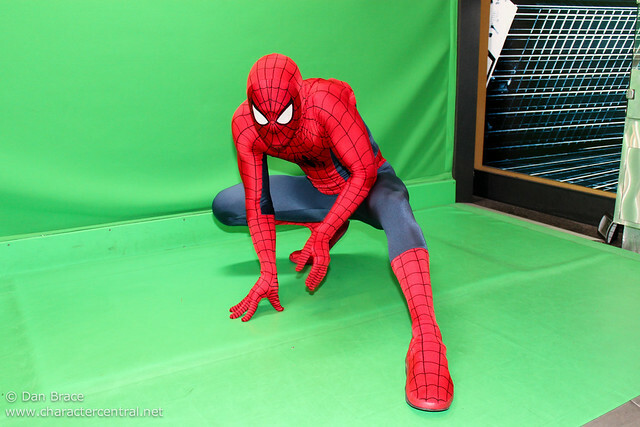 Spider-Man made his grand Disney Parks debut eighteen months ago, in April 2014, at Disneyland Paris. We were the first guests in his line, and have met him numerous times since. The meet 'n' greet there is well set up, and we have no doubt that Disneyland will do an equally good job when the Super Hero HQ opens next month. First of all, apologies for being absent recently, we have had a lot going on here (real life) and so I haven't had chance to keep as up to date as I would like. Anyway, there are some cool new things I want to talk about today. First of all the big event of the week will be the 24 hour event, "Rock Your Disney Side", coming to Walt Disney World's Magic Kingdom and both Disneyland Resort theme parks on Friday this week (23rd). Details are a bit sketchy right now though, sadly, as Disney seem to want to keep tight-lipped about which characters will appear, when and where. Of course, this doesn't make planning easy, especially since it is likely to be exceptionally busy like the previous events! Event operating hours: 6 a.m May 23rd until 6 a.m May 24th. Mickey’s Soundsational Parade at 6:30 p.m and 12:30 a.m. ? Fantasmic! at 9 p.m and 10:30 p.m. ? Magical fireworks at 9:25 p.m. Extra performances are planned for “Disney Junior – Live on Stage!” at 9:30 a.m and Disney’s Aladdin – A Musical Spectacular at 7:55 p.m. ? World of Color at 9:45 p.m and 3 a.m. ? Mad T Party Band and White Rabbit DJ from 9 p.m – 5 a.m. In terms of characters, that's pretty much all that has been announced for DLR, sadly. Of course everyone anticipates that there will be a lot of characters out and about, and there is speculation floating around that some characters - villains in particular - may replace the princesses at Royal Hall, but that has not been confirmed publicly by Disney yet. Event operating hours: 6 a.m May 23rd until 6 am May 24th. Everything kicks off with a special edition of the Welcome Show, as heroes and villains make their way to Magic Kingdom Park. The Move It! Shake It! Celebrate It! Street Party will feature Disney heroes at 10 a.m and Disney villains at 1:30 p.m. When it comes to the 5:45 p.m. performance, though, exactly who makes an appearance will be determined by your votes throughout the day! (More information on how you can vote will be posted on Friday morning on the Disney Parks Blog). 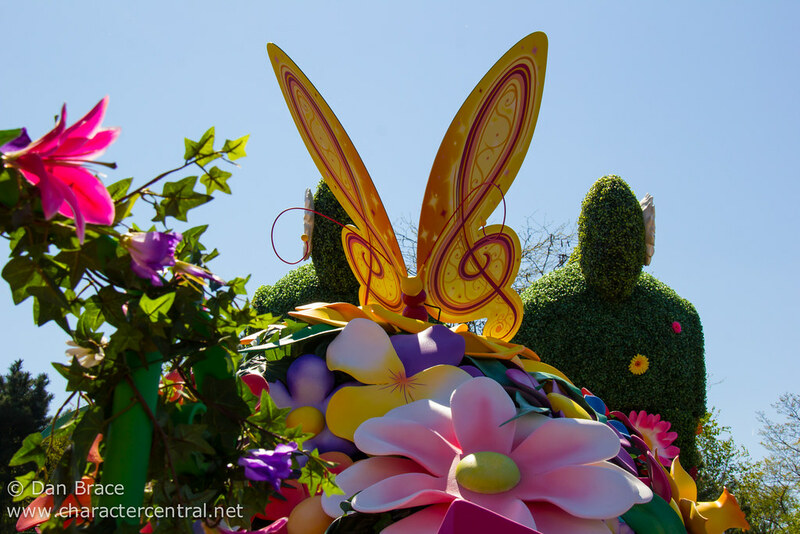 Magic Kingdom Park parades will each have two performances. “Disney Festival of Fantasy Parade” will be at 12 p.m and 3:30 p.m, and Disney’s Main Street Electrical Parade at 11 p.m and 1 a.m. Starting at 11 p.m half of Princess Fairytale Hall becomes Scary Tale Hall, where you can meet Maleficent and the Queen. 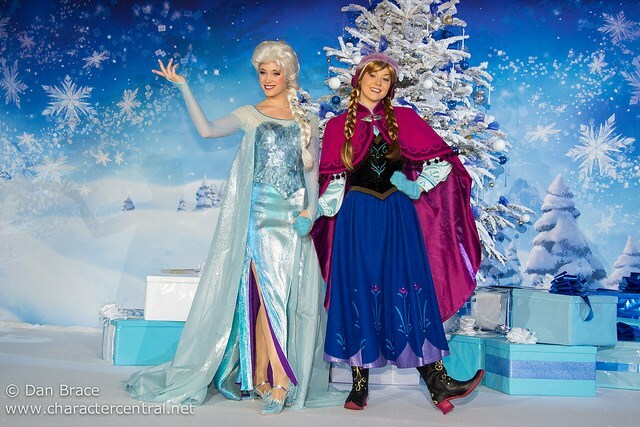 The other side of the hall will still feature favourite royals Anna and Elsa. Around 1:45 a.m, the villains will take over the rest of the park’s character greeting locations. Where Aladdin and Jasmine appear in Adventureland during the day, expect to find Jafar. Dr. Facilier takes the place of Princess Tiana in Liberty Square, Captain Hook replaces Peter Pan in Fantasyland, and more! In Tomorrowland, the INCREDIBLES Super Dance Party rocks the Rockettower Plaza Stage from 4:30 p.m – 10 p.m, and is expected to feature characters from 'The Incredibles'. The event concludes with a special “Kiss Goodnight” at 5:50 a.m at the Railroad Station in Town Square on Main Street, U.S.A. The Move It Shake It heroes line up is likely to include Hercules, who has been seen out and about at EPCOT the past few weeks in preparation for his starring role in this event! It should be noted that for both WDW and DLR there were more things announced such as bands, food and merchandise, which you can find out about if you search the Disney Parks Blog. 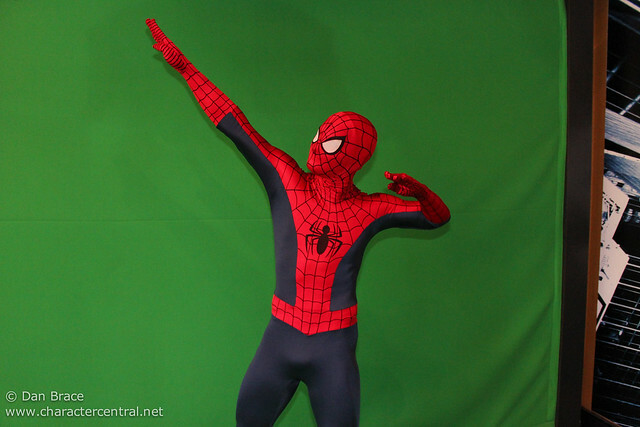 Here at Character Central our main focus is of course characters! 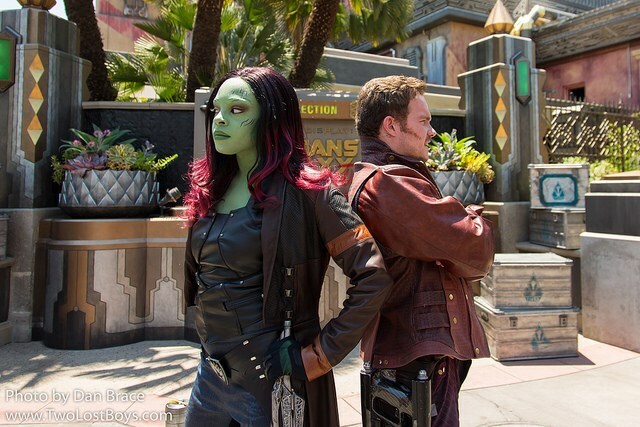 Staying with Walt Disney World, and this year's Star Wars Weekends Celebrity Welcome and Motorcade saw the debut of three new characters to the Disney Parks! Sabine, Ezra and a grumpy droid named Chopper have all landed on Earth for the special weekends this year, from their new Star Wars TV show, 'Star Wars Rebels'. Check out this video below from Attractions Magazine, which features the new characters in the Motorcade! At the Magic Kingdom, Tinker Bell and her fairy friends have left the Nook in Adventureland, and sadly all the fairies have now left Florida and are heading back to Pixie Hollow. Tinker Bell has found a new home at Town Square Theatre on Main Street USA, filling the empty space left by the princesses when they moved into the new Fairytale Hall. Other recent character changes in Walt Disney World include the Pooh characters leaving Animal Kingdom, and Donald and Daisy replacing them - just in regular outfits, sadly (I wonder what happened to their special DAK costumes from when they met in Camp Minnie-Mickey?). Taking the heat off the summer at Disneyland Park in California, the Disney Parks Blog announced the other day that Anna and Elsa from the ever-popular Frozen will feature in a brand new pre-parade addition to Soundsational. At the moment no other details are known except they will feature from "mid-June". Keeping with Frozen, and the big news this week was that there will be a brand new Disney On Ice show this autumn featuring the characters from Frozen! You may recall that I actually reported about this way back in January, when I even suggested that characters such as Olaf and Sven would appear, and now it has come true! The video below was posted by Disney On Ice and shows some great concept art for the new show. The description on the Disney On Ice website also specifically mentions Olaf, Kristoff, Sven and the magical trolls, leading us to believe they will all feature in the new show! Finally for news, and Hong Kong Disneyland finally announced today that their new nighttime parade will debut in October, ending long running speculation that it would start in the autumn. The brand new electric light parade will use innovative new technology and will be interactive, too, whereby guests can use a mobile app to control the colour changes on the floats! Don't forget that Disney's Swing into Spring season continues at Disneyland Paris until the 22nd June, and features a fabulous new show-parade, characters and other offerings. You can read my review of it here, and visit our dedicated guidebook page to it here. 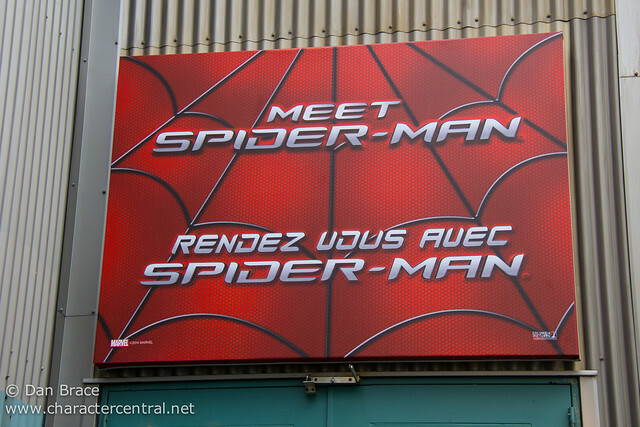 You can also continue to meet Spider-man at Disneyland Paris until the 10th July. 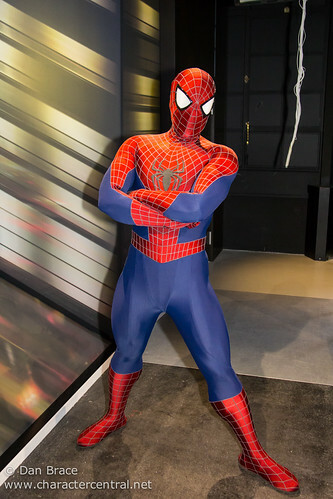 The Walt Disney Studios is the only place in the world you can currently meet the webbed hero! You can read my review of our meeting with him here, and visit our dedicated location page here for more photos and information. Finally, don't forget that the Halloween and Christmas party dates for WDW were released less than two weeks ago. You can check all the dates on my previous blog post, here. Today Walt Disney World released the dates for their popular Mickey's Not-So-Scary Halloween Parties and Mickey's Very Merry Christmas Parties at the Magic Kingdom. Today, 5th May, is also the day that Doc McStuffins finally comes to Disney California Adventure, having already been at Disney's Hollywood Studios in Florida for quite some time now. 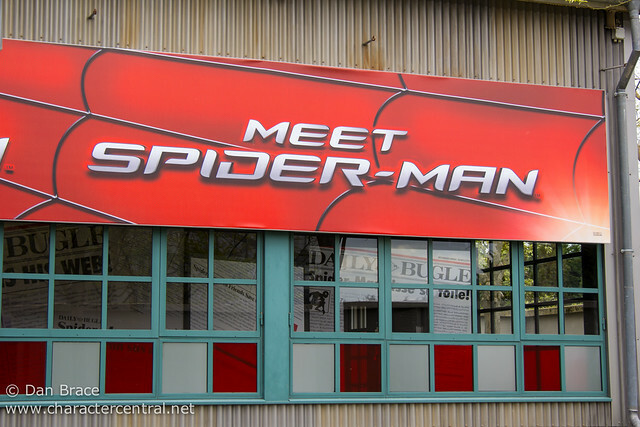 If you're planning a trip to Disneyland Paris in the coming weeks, remember that they have lots of exciting things going on right now, such as their brand new Swing into Spring season and Meet Spider-Man at the Walt Disney Studios! 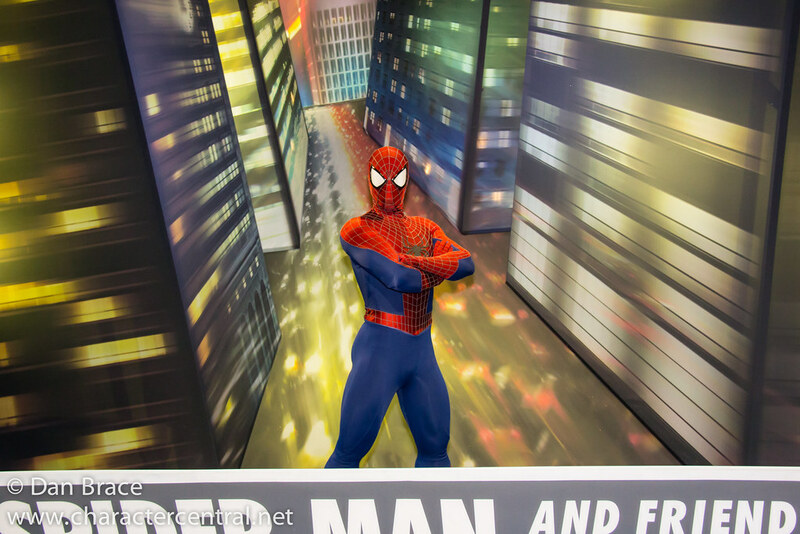 This past weekend Jon and I were fortunate enough to be at Disneyland Paris for Spider-Man's official Disney Parks debut! We were up bright and early Saturday morning, and were first in line to meet him on his big day! His photo location is at the Backlot area of the park, next to the Blockbuster Cafe (which recently received an Iron Man overlay). 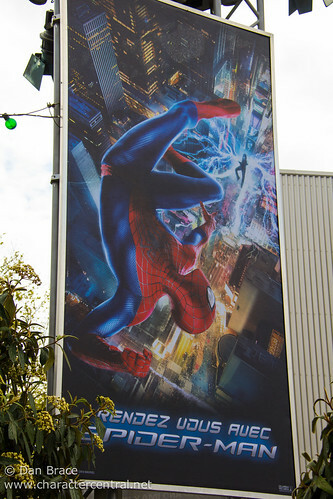 Throughout the Studios all the way down to the location there are new signs advertising the experience. Once you arrive at the area there is an outdoor queue area with a wait time board. 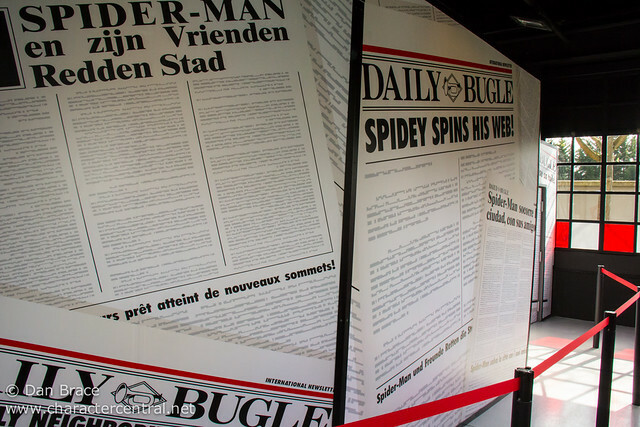 Once you get through the outdoor queue you proceed to enter the main building which has a short indoor queue featuring oversized pages from the Daily Bugle (the newspaper Peter Parker works for). Then finally it's your turn! You are made to enter behind a set piece which serves as a frame for your photo. 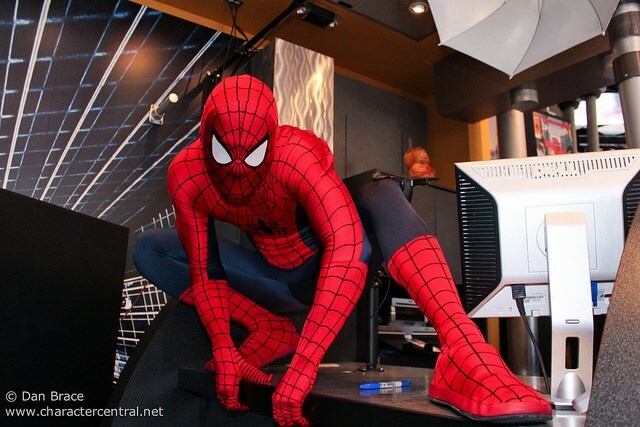 Spider-Man is there waiting for you! The Cast Member will ask for your camera, or you can just get a PhotoPass one. Strike your best pose, you're about to be headline news! 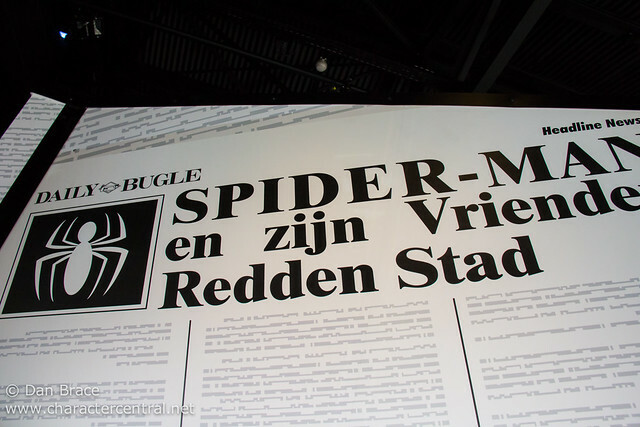 And voila... You just made the front page of the Daily Bugle! Neat, huh? This is a great new addition to the park, and one I am sure will be popular with the boys (as well as girls of course, but more so with boys I would imagine). 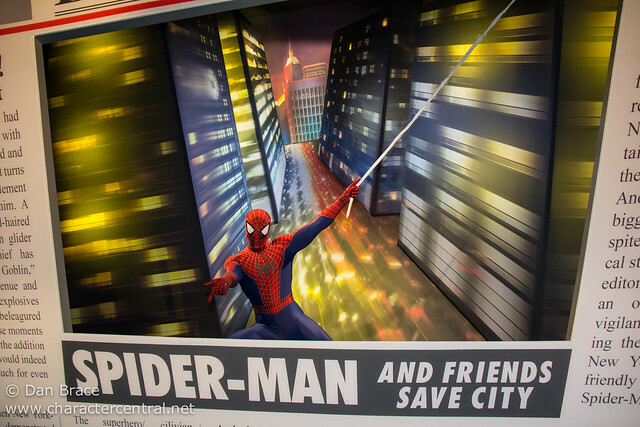 Disney did a good job of the photo location, and Spider-Man himself looks great. We have had a lot of questions on our Facebook and Twitter about whether Spider-Man can speak, and I can confirm that he does. 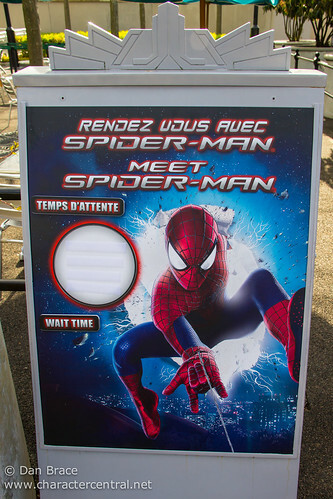 Officially Spider-Man will be at Disneyland Paris until the 10th July, but given how popular he is already, I would anticipate he would stay longer. I guess we shall have to wait and see! 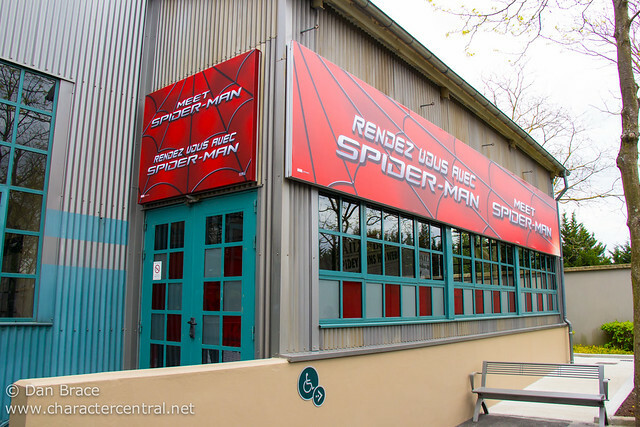 Today various French Disney fan sites are reporting rather conclusively that the long rumoured Spider-Man will finally start greeting fans at the Walt Disney Studios Park (at DLP) from Saturday 19th April! He will be located next to the Blockbuster Cafe in the Backlot. Quite by chance, Jon and I will be there that day, and are really excited at the prospect of being among the first to meet him! We have no doubt that we will be at the park gates bright and early, and will go directly to his greeting location at park open! 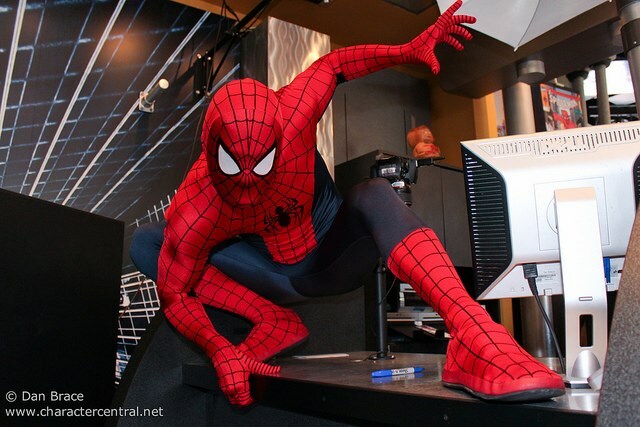 Of course, we have previously met Spider-Man at Universal's Islands of Adventure in Orlando, FL, even since the Disney purchase of Marvel. We could argue that in that respect, we have met him, as he was technically Disney when we met him... But of course it's exciting nonetheless to be finally be able to meet him at a Disney Park! This is, as always, subject to change, and who knows, perhaps he'll show up even before the 19th. Whichever way it works, we'll be there at the earliest opportunity to meet him! 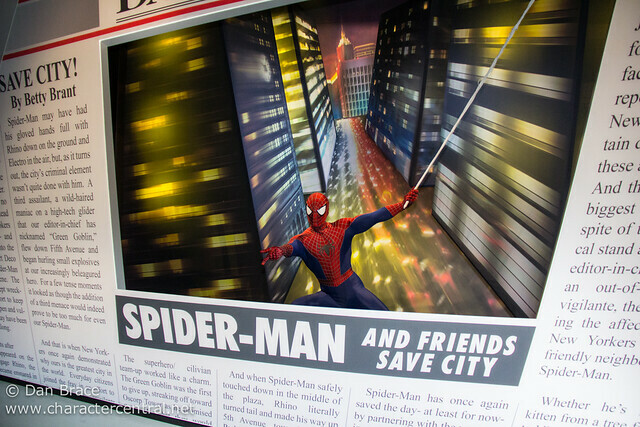 Below are some pictures of when we met Spider-Man at Universal's Islands of Adventure. This morning the Disney Parks Blog announced the official start date of their much anticipated brand new day parade, Festival of Fantasy. Sunday 9th March will be the first day of the new parade at the Magic Kingdom, which has replaced the former Celebrate a Dream Come True Parade, which ran for many years in various forms. It is a huge relief to finally have a new parade and we look forward to seeing the full performance, and what surprises Disney haven't yet revealed once it steps out for the first time! Over at Disneyland Paris the rumour mill was working overtime again today, and it has been posted across many French fan communities that Spider-Man is set to become the first Marvel character to appear at the resort, by the end of March! 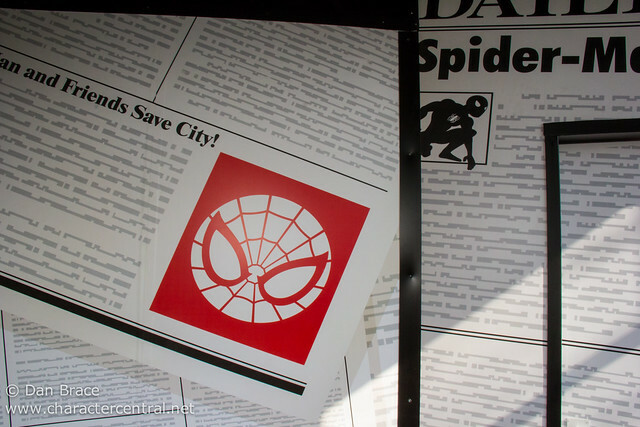 Spider-Man's location will apparently be at the former annual passport office next to the Blockbuster Cafe (which itself recently got a new Iron Man theme). It would be a really exciting addition to the park, and a great opportunity to break the Marvel universe into Disneyland Paris. I did some asking around, and was told that it is true, but of course anything can change, so I really hope it is, and that we see Spider-Man there by the end of March. If he is a success, then it could pave the way for more Marvel heroes to show up there. Lots more rumours have been going around today about the appearance of Oswald the Lucky Rabbit at Disneyland Paris and Tokyo Disney Resort, which I talked about in my news post yesterday. As with Spider-Man, I hope this isn't just a rumour that has gone wild, but instead based on some truth, and that Disneyland Paris and Tokyo get Oswald - we've been waiting a long time to finally welcome him to the Disney Character family! Ok, that's everything for now. Have a great Monday everyone. There's a few things of interest this week that I thought I'd share. Sadly I haven't really had time to catch up properly recently after the big around the world trip, so you'll have to just go with it! Anyway, Disney's Monstrous Summer at both US resorts has now started, and brings with it some new characters and greeting opportunities. At Walt Disney's World's Disney's Hollywood Studios, Mike and Sulley can be met in their new MU dorm setting (same place as their old location), in their new MU outfits. At the Big Hat they perform in the homecoming show, which is basically a large pop/rock dance party. At Disney California Adventure, Mike and Sulley can be met, again at a new MU dorm setting, down in Hollywood Land. The PIXAR Play Parade has been refreshed too, and stars Mike, Sulley and some brand new Monsters friends! Art, Scott "Squishy" Squibbles, Terry and Terri, and Archie the Scare Pig all join them! We'll be there in August and really look forward to seeing them! Art was out for meets during the most recent 24 hour event back in May. Sadly we were not there to meet him (we were in DLP at the time!). From the 1st to the 7th of July at both US resorts, Independence Day will be celebrated for a whole week, and will feature special character opportunities. At Disneyland you will be able to meet Mickey Mouse in patriotic clothes, in Town Square every evening. 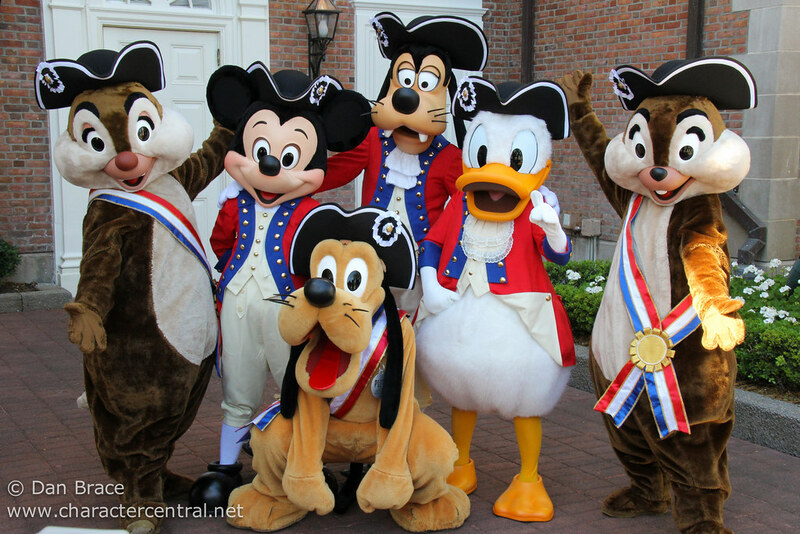 At Walt Disney World Goofy, Donald and Pluto will feature in patriotic clothes in a special pre-parade at the Magic Kingdom, which will also feature EPCOT's Fife and Drum Corps, as well as the much loved Citizens of Main Street (just how WDW use them in other pre-parades). Interestingly, WDW have not yet said whether there will be character greetings at the American Adventure in EPCOT this year. Every year, for the last few years at least, WDW have featured Mickey and friends in patriotic clothes, as well as appearances by historical figures such Betty Ross and Benjamin Franklin. I hope that the pre-parade is not a replacement for those greetings. That would be quite sad indeed to cut those. Probably the biggest news this week is that for the first time ever Disney will feature Marvel characters! Of course, they will be for limited sets at this years D23 Expo event in August, but it is a huge step nonetheless. It is expected that Spider-Man and Iron Man will appear for limited sets on one of the days. D23 will also feature Sofia the First (who debuted in the Christmas Day Parade at WDW last year, but not seen since), and for the first time Doc McStuffins! The programme of events also listed characters from Jake and the Neverland Pirates, but of course we already have Jake at the parks, sparking speculation that maybe Izzy or Cubby might be coming! Our friends at Inside the Magic have a complete breakdown of the entire event, with the greeting times, so be sure to check out their post here. Ok, I think that's everything for today.